Octave Electronics CAT SRM advertisement from page 41 of Contemporary Keyboard Magazine December 1977. This ad ran in CK magazine for four months starting in December 1977, introducing a new updated CAT model - the "SRM" (Series Revision Model). 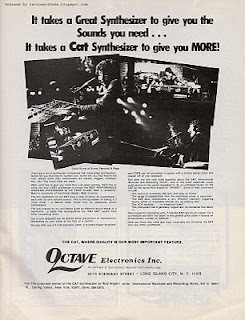 After the ad's last appearance in the March 1978 issue, it looks like Octave Electronics took a 16 month break from advertising anything in CK magazine, with a new ad not appearing until August 1979. The previous CAT ad showed up only once in the November 1977 issue of CK. And if you recall, it wasn't one of my favorites. But, obviously some designer back in 1977 agreed with my reasoning, and solved many of the problems with that previous ad. The tag line is of a reasonable length: The CAT "SRM" Synthesizer - now with 2 note memory. Simple and clear. The text size has been increased a bit - and I think there is even a bit more room between the paragraphs. No white-space abuse here. The white space between the title, photos, ad copy and logo footer are spread out creating a more balanced feel. In addition, the designer has incorporated a light gray background to frame the ad better on the page - unlike the previous ad where everything just kind of floated on top of the white page. 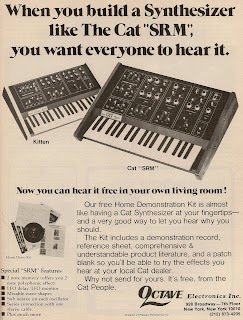 The one problem this ad didn't solve, and that NONE of the CAT ads have managed to do so far, is SHOW ME A CLOSE UP OF AN ACTUAL CAT SYNTHESIZER. Come on! Do you really think a real-life CAT synthesizer made it up to the local synthesizer shop in my little Canadian town? Instead of a close up shot of a CAT SRM, we are treated to some much cleaner action shots of David Burns of 'Burns, Renwick & Rags' - or as PINWIZZ calls them in a comment he left in the last CAT ad post: synth-hero photos. Unfortunately, by the looks of the back panels of the CAT synthesizers, I think he is playing two original CAT synthesizers - not SRMs. But, do you think the fans of David Burns would have notice something like that back in 1977 when viewing this ad? And does it really matter since the CAT and CAT SRM look almost identical? Nowadays, it would matter. Many fans are gear-heads and will comb through musician's action shots and videos at a micro level to try and figure out what old and new gear is being used. Often the gear used is as important as the musician using/endorsing it. But are we focusing too much on the good gear and not enough on the good artists? 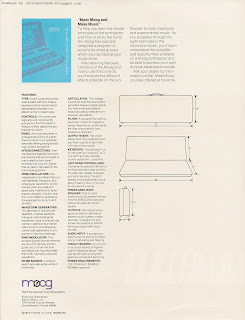 Moog Imoogination Book advertisement from page 34 of Contemporary Keyboard Magazine May/June 1976. 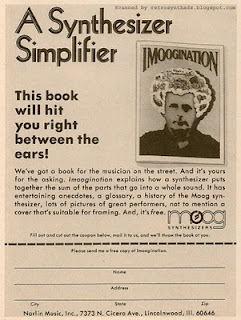 ...I came across an old 2007 auction for 'Rare Moog Synthesizer literature' - Imoogination. I recognized that crazy Bob Moog image immediately and looked back over my old issues of CK. Sure enough, I found this ad. The ad is for the original Imoogination 'book', so the first volume must have come out sometime in late 1975 or early 1976. Since the ad doesn't mention Volume 2, I'm gonna guess it was released sometime after June 1976. The auction states that the first volume of Imoogination was 20 pages and the second volume was 32 pages. Both were done in a newsprint format. I did a bit more searching to try and find some better photos and sure enough, MATRIXSYNTH had also posted a Flickr set from a 2008 PNW synth gathering that included a few Imoogination literature shots. Here's one image that shows some of the content of the books. "Inside are features with Keith Emerson, Rick Wakeman, Milton Babbit, Roger Powell and some fascinating facts about Bob’s background. " "The seed of the idea came from the already mentioned 'imoogination' (Moog advertising/propaganda from the 70's) article where some guy was trying to explain why Moog products sounded better than the competition. The accidental phase sync thing just stuck with me for some reason. From memory, some of the other things mentioned included really fast attack times (combined with hopeless vca trim resulting in DC in the output), very high quality filters (yeah right)." I couldn't find too much more... if anyone knows anything, please send me an email or comment. I definitely have to try hunting those down! 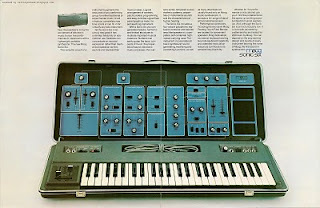 Moog Sonic Six brochure from 1974. I've seen the cover of this Sonic Six brochure around the 'net a bit but not the rest of the pages. The centerfold text and image, along with the back page, provide some great reference material. I've never seen or heard this synthesizer. But I love it and everything it stands for - Education. The Sonic Six was marketed as a educational tool for the classroom. Sure, the brochure mentions using it in 'live performances', but even the photo looks like my high school band room at lunch hour (minus the Sonic Six). Turn the page and read the centerfold text, and you can see that this brochure is aimed squarely at music educators, where 'students can concentrate on musical expression ... as they explore and express their musical ideas' and 'grasp the basic concepts of music'. The Sonic Six can help you, the educator, 'illustrate important musical material'. On the back page, Moog explains that they have 'specifically designed a program of lessons for small groups which you can take at your music store' called 'Meet Moog'. 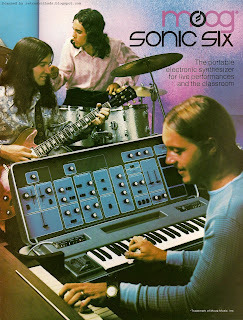 The lessons include an instruction booklet with eight exercises to help you learn the basics of the synthesis on the Sonic Six. Nice. One of Moog's main competitors in the educational sector, even before the Sonic Six, was surely EML. In Mark Vail's Vintage Synthesizers book, one of the founders of EML, Norman Milliard, talks about how EML really got a kick start thanks to Moog. Norman was setting up his booth at a music educator's convention where Bob Moog was supposed to be the featured speaker. But Bob's plane was snowed in and convention organizers asked Norman to speak to the 2000+ crowd. The result - a lot of business. The competition is also clearly seen in the design of the ElectroComp 101 - it bears more than a slight resemblance to the Sonic Six with its clearly separated synthesis sections and portable form factor. Okay, one final note - a confession of sorts. I have an extreme fetish for portable synthesizers. If you are gonna shove the guts of a synthesizer into a suitcase, then count me in. The EML 101. The EMS Synthia A or AKS. The Sonic Six. I love all of them. I even like looking at the P (Portable) series of Moog Modulars rather than the C series. I'm glad I got that out in the open. Moog Micromoog synthesizer ad from page 5 of Contemporary Keyboard Magazine, October 1977. This is the second of two Micromoog ads published in CK during the Micromoog's lifetime. The first ad, which I blogged about back in August last year, ran from mid-1976 to early-1977 until this ad took over and continued to run periodically until the end of 1977. Interestingly, after stopping the promotion of the Micromoog in CK, the company took a breather from marketing synthesizers in CK entirely for about six months until the second half of 1978. 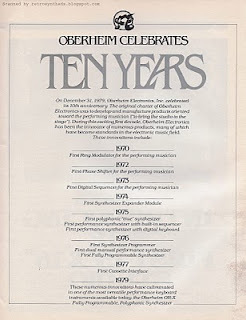 After blogging about the great placement of Oberheim's anniversary ad in my last blog post, I started to think about how I always noticed that certain company's ads showed up month after month on (or very near) the same page of CK. This practice seems to be quite common in many magazines, and this ad is a perfect example. Moog held on to page 5 - directly opposite to the Letters section- throughout 1977, and if it wasn't a Micromoog ad you saw, it was a Polymoog ad. 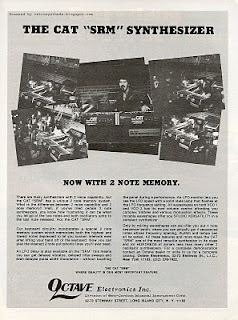 This ad is also one of the earlier Moog ads in CK to feature, front and centre, some great musicians' endorsements - Chick Corea and Herbie Hancock. Synergies in marketing is everything, and using these two wasn't an accident. 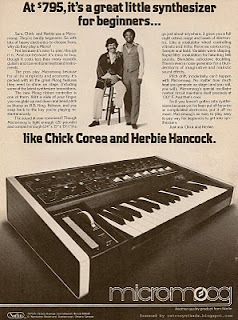 Chick Corea was a column writer for CK during this time period, and Herbie Hancock was the cover story the following month (which also featured the same Micromoog ad on page 5 again). That's some great Marketing 101. 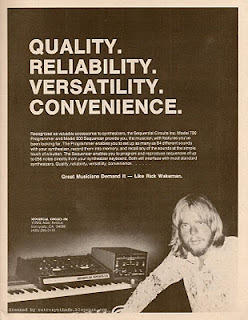 One other thing I noticed was that although this ad does mention the lack of pitch-drift available with the Micromoog, it doesn't mention specifically "thermostated oscillator", a buzzword that was featured so prominently in their earlier ad. I thought the term was great marketing, but maybe it was just too scientific for the musician crowd.